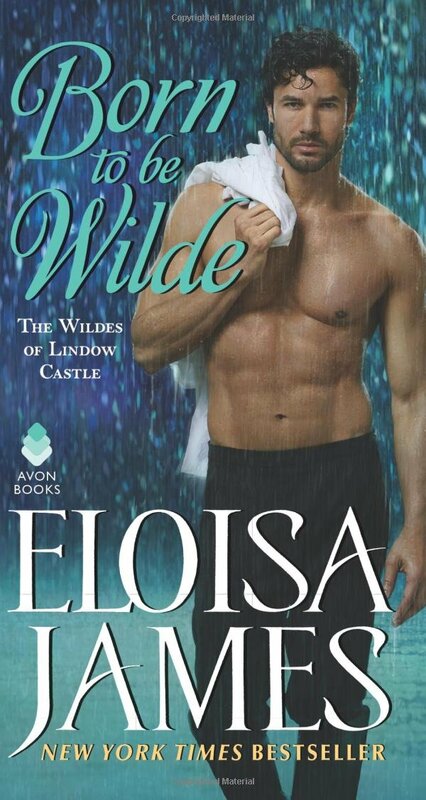 Let me start off by saying I'm so enjoying this loud, supportive, meddling, loving family that Eloisa James has created in the Wildes of Lindow Castle series. The family dynamic (both good and bad, humorous and emotional) rings true and reminds me of the large family of siblings and cousins that surrounded me as I grew up. Another theme that threads its way through these books is friendship. Specifically, female friendships. In each book, those friendships shift and evolve as do the characters themselves. As each of their stories unfolds, James slowly reveals more of each character, allowing us to see them in a new light even as the character herself begins to recognize and accept the changes, the strengthening, within herself. Finally, the romance. Parth and Lavinia have been striking sparks off one another since the first book in the series but, of course, both of them chalk it up to their instant dislike of the other. She thinks he's a rich know-it-all while he thinks she's a flighty spendthrift dangling the men of the ton at her feet. Neither is willing to look beneath the surface emotions until unforeseen circumstances force them to. But once they did, my heart was with them the entire way. Watching Lavinia dig deep for courage and strength, take control of a dire situation, find a way out on her own, and find her passion in the process endeared her to me more than almost any other Eloisa James heroine. The growth of this character was inspiring. I was in her corner, cheering her on the whole way. I was in Parth's corner too, often saying, "Wake up! You're going to lose her!" Parth has a fair amount of bias against what he views as Lavinia's shallow obsession with fashion. Man has some hard lessons to learn but learn he does, as his grand gesture near the end of the book proves. I adored it...and him. I found Parth's personal journey to be just as emotional as Lavinia's and necessary to their happy ending. They may have begun their journey at cross purposes but by the end of their story I was confident these two would have a wonderful, passionate life together as true partners, in and out of bed. Kudos to Eloisa James for another witty, humorous, sensual, emotional, heart-tugging journey with the Wildes of Lindow Castle. I've been looking forward to their story. I always felt that there was hidden chemistry between them. I just picked this up from the library a couple of days ago, so, thanks to your review, I'm even more eager to read it now. There's plenty of chemistry just waiting to explode, Diane. Hope you enjoy their story! I haven't started this series yet. But I am sooooo looking forward to reading it during the upcoming winter when I am likely to be snowed in for long stretches at a time. Enjoyed your review. Aren't we fortunate to live in a time when we have authors who provide us with wonderful stories of people we love. Eloisa James is one of those authors. There are a few others and again, aren't we fortunate? I loved this story! Lavinia is one of my new favorite heroines! Thank you for the review. EJ is one of my longtime favorites. I always look forward to her books. This one sounds like it will prove to be another good one. I so enjoy Eloisa's books. My daughter & I have been sharing the books in this series. Thanks for the great review PJ. Sounds like something I am going to have to add to my tbb and tbr lists lol.